Here is the walk around video of the pocket rocket conversion of the bucket-a-day. Over the next few days I’ll post the videos of this thing here. That way they will be all in one spot. And two more to go. Last two and that’s it for this one. 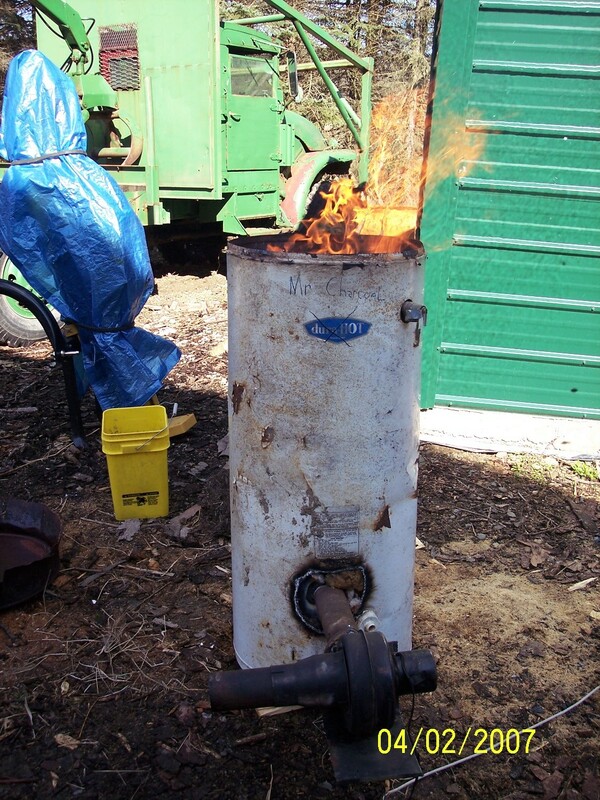 This weekend I’ll see if I can find the large tlud boiler hybrid compost heat video. 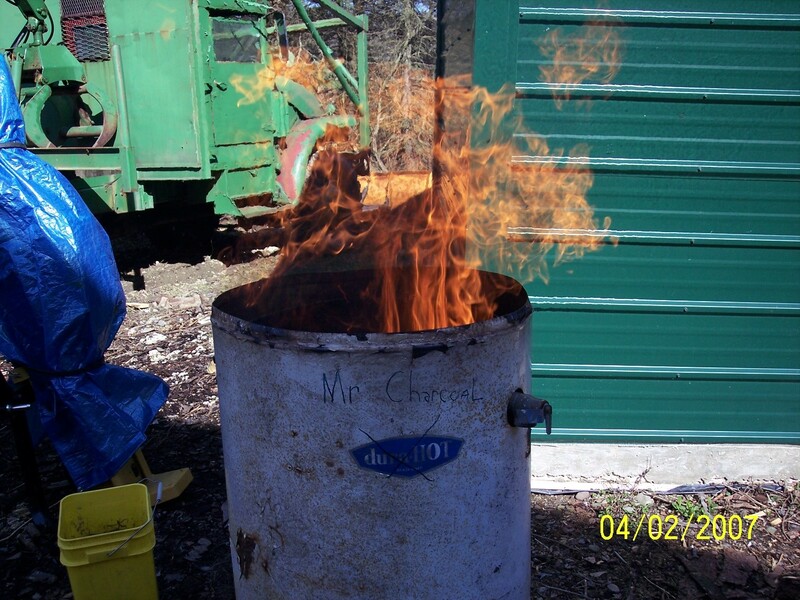 This was a hybrid compost heat and TLUD heated boiler and charcoal maker. 2000 gallon tank covered in compost and heat added by the boiler above the large TLUD. 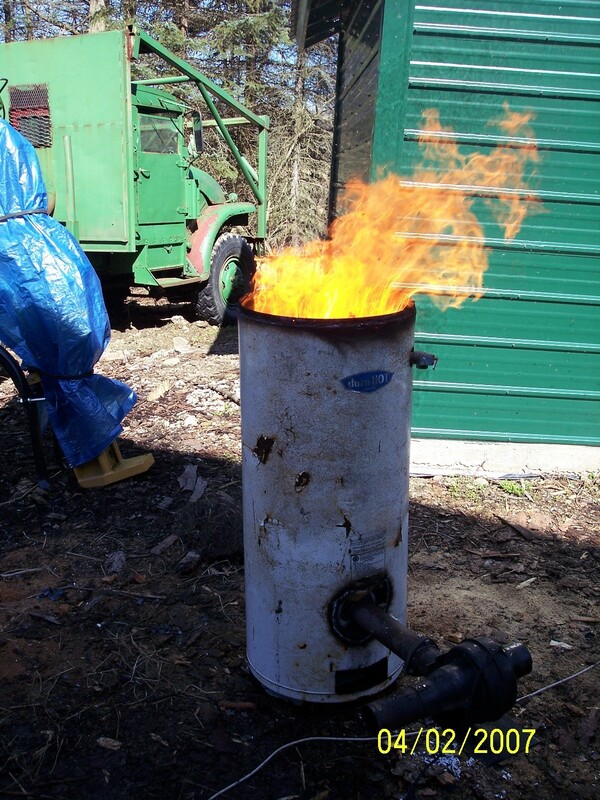 Boiler made from 55 gallon drum below. I called this the Twister. Also had a version that I put on the top of the large TLUD in the above. 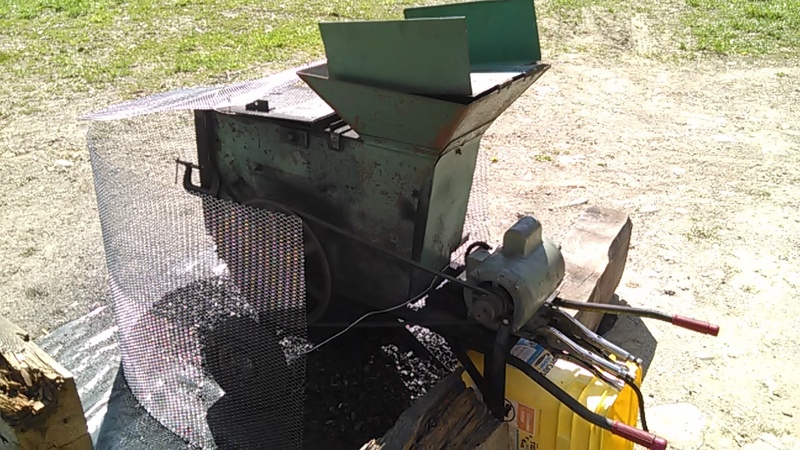 It was meant to burn chopped switch grass and sawdust but it also made charcoal. 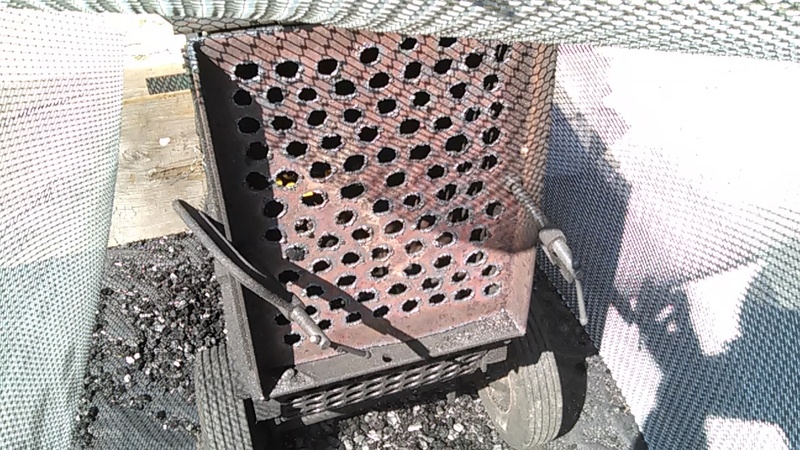 The charcoal would build up in the bottom. Feed the fuel into the blower and the fuel and air went round and round burning up and charcoal ending up in the bottom. Started a normal fire in the bottom then started up the blower/fuel. Thanks Thierry for the kind words. The spirit might be inexhaustible but I feel the body is starting the exhaustible journey. it smoldering or gasifying slowly for a long time. this under electric lines the first time. You will need to spray water on the pile at the right time in order to keep the fire from burning up the charcoal. Opps, that was a large photo… Anybody know if I can delete that…??? Years later when I drag a log over this area it turns up nice black soil. But it is interesting that you could not tell from the vegetation that is growing in this area. Mr. Charcoal was made from an old hot water heater. The shell and fiberglass was kept for insulation. The top was cut out and used as a grate for the bottom. An electric blower blew in below that. 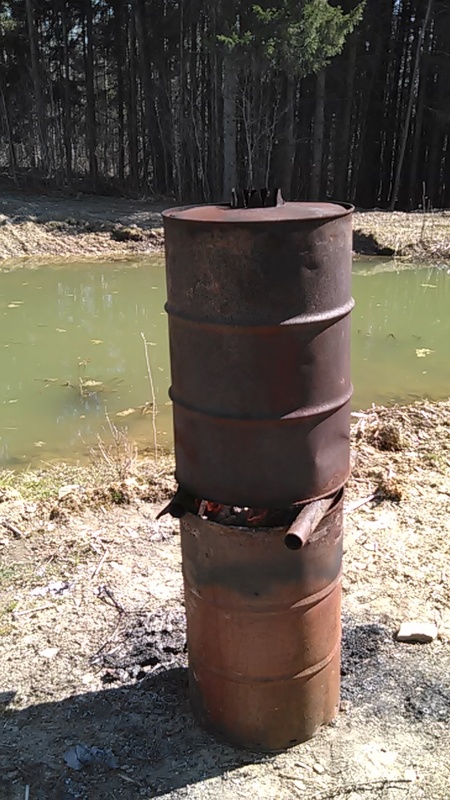 It did make charcoal from switchgrass to wood but I did not have a good way to cap the top. It was also too heavy to tip over but maybe if it was like a cement mixer with a handle to dump it. For those two reasons it had low charcoal yields. Reducing the rpm was a big help. Also used some plaster cloth to keep most of the charcoal from flinging away. Next made a screen for the front. That also helped. Need to open up the holes some more. Also the rear needs a screen. Right now it has a flapper adjustment that really changes particle size. P.S. the Kemp is a hammer mill. And then there is the Gilmore/English and others large TLUD method. Check out the Merry-Go-Round. PDF can be found at the end of the link. I really like the skidder you built. 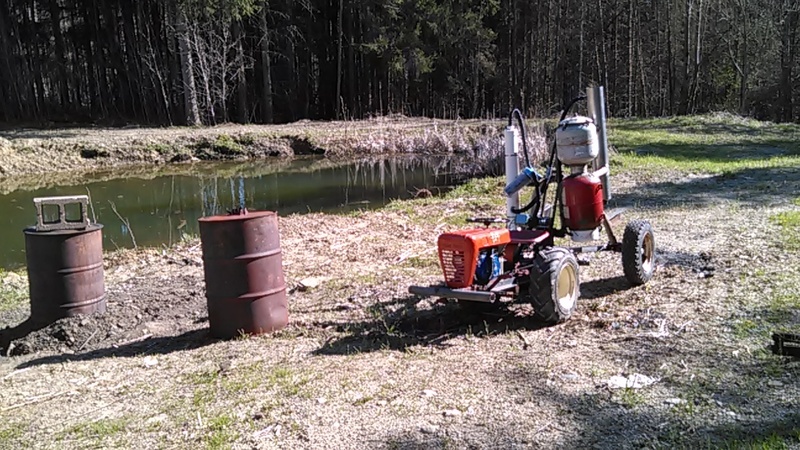 It’s amazing a little 6.5hp engine can tug those logs through the woods on charcoal. That puts you at just above 3hp? I think most of us would enjoy a video of a walk around of what you did there, if you don’t mind sharing your info? I am really interested in how the steering works as well. You are a very creative man. Will you be going to Argos? 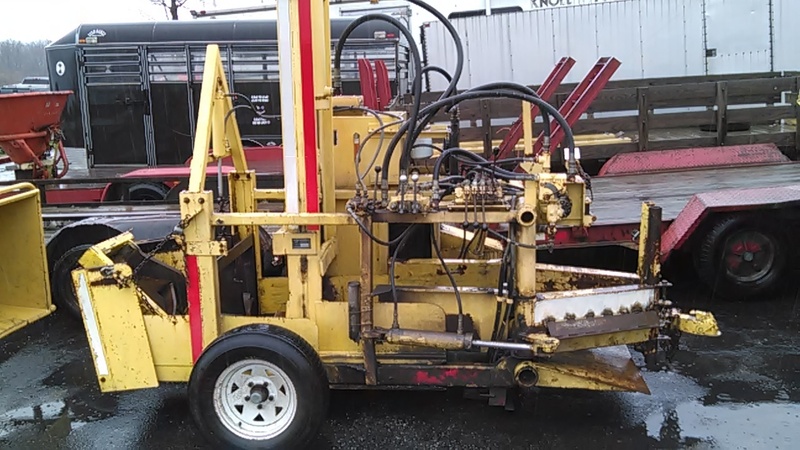 If so, will you be bringing this machine? Thanks for the kind words. No idea of the HP, I need to make a prony brake. Later I could shoot a better walk around video. I should be at Argos with the machine if things go well. The steering seems to be working well. I was hoping to hear that you will be at Argos. Even better that you’re bringing your machine. One of the biggest spring auctions that I remember. I’m getting old because I was beat after about 6 hours. Missed a lot of tanks and a few cub cadet garden tractors. One had the creeper gear. I was also out of ammo after winning the 14" Chomper. Okay I’ll bite, what is a chomper?